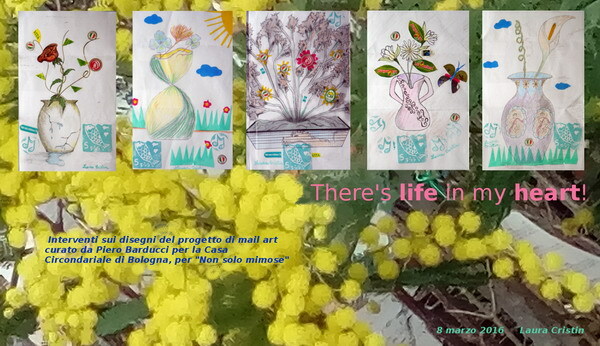 In early March, I received 5 drawings from women of Dozza jail of Bologna, as part of the mail art programme conducted by Piero Barducci. I was asked to make an art intervention and to send them back. These will be exhibited along with the originals and the other ones involved in the project. Since all of them represented chopped off flowers in vase, it was easy to add a wider context with elements of alive nature, along with the idea “there’s life in my heart”. The technique of collage and rubberstamping was used. Interventions with the technique of collage and rubberstamping on 5 drawings from women of Dozza jail.